And up-and-coming pop group here at the Poly [Polytechnic School - Ed.] 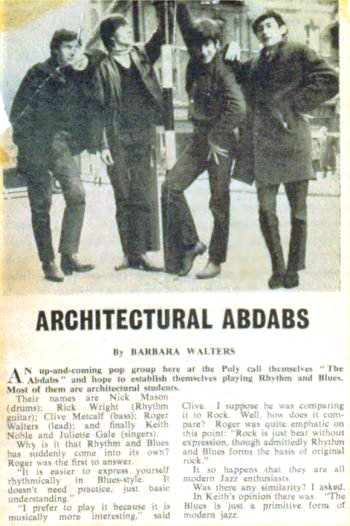 call themselves "the Abdabs" and hope to establish themselves playing Rhythm and Blues. Most of them are architectual students. Their names are Nick Mason (drums); Rick Wright (Rhythm guitar); Clive Metcalf (bass); Roger Walters [sic] (lead); and finally Keith Noble and Juliette Gale (singers). Why is it that Rhythm and Blues has suddenly come into its own? "It is easier to express yourself rhythmically in Blues-style. It doesn't need practice, just basic understanding." "I prefer to play it because it is musically more interesting," said Clive. I suppose he was comparing it to Rock. Well, how does it compare? Roger was quite emphatic on this point: "Rock is just beat without expression, though admittedly Rhythm and Blues forms the basis of original Rock." It so happens that they are Jazz enthusiasts. Was there any similarity? I asked. In Keith's opinion there was. "The Blues is just a primitive form of modern jazz."